On other topics, the oldest piece of Native American art found in North America is a buffalo skull with a red lightning bolt painted on its forehead. It was unearthed at the Cooper archaeological site north of Fort Supply. This is a bison kill site dating from 10,900 to 10-200 B.C., or BCE. Bison would be herded into a ravine, or arroyo, and hunters lining the rim of the arroyo would kill the bison with spear and bow and arrow. The archaeological significance of the skull is it being the oldest known painted object in all of North America. But, before we romanticize the Old West, here are just a couple of the realities. A 50-ft mound of buffalo skeletons. These 1880 pictures of bison bones show just this one pile towering more than 50 feet at the Michigan Carbon Works, Detroit, where they were processed into fertilizer, bone meal, burned into charcoal for refining sugar, and used to strengthen bone china dishes. 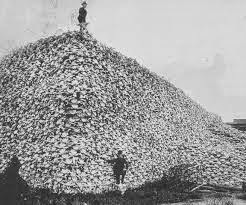 Homesteaders could often earn much needed money by gathering the skeletal remains of buffalo slaughtered on the plains. Buyers at railroad shipping points would pay from $4 to $12 per ton for the bones and horns. Just one of many firms buying and shipping bones estimated that in just a seven year period, from 1884 to 1891, they shipped 5,950,000 skeletons for processing. In one year, 1872, the Santa Fe Railroad shipped over one million pounds of bones. The next year the total reached 2,740,000 pounds of bones, but the record year for the Santa Fe was 1874, when they shipped over 7,000,000 pounds of buffalo bones. Extra money could be realized by separating the skulls and selling them as souvenirs. 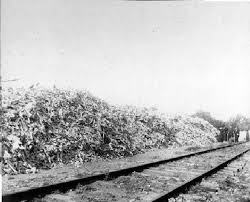 A railroad siding with a continuous mound of skeletons. Souvenir buffalo skulls and horns, sought by collectors in the East. It has been estimated that when Columbus arrived in the New World in 1492, there were 60-million bison on the American plains. During a relatively short period before 1889, the buffalo had been decimated to a mere 541 remaining in existence. With the interest in preserving and protecting the American bison, by 1951 the numbers had increased to 9,252. With the current destructions of countless species of wildlife, there continues to be the irrefutable evidence that humans are the dumbest of all mammals with the least ability to learn from their own history. We write about our history, publish books about it, and still can’t remember it or understand it. We continue to confuse wisdom and greed, with greed winning every time. There were also displays concerning the Indian Wars, which were waged in what would become the Oklahoma Territory, from 1858 to 1874. In the American West, the Indian wars continued from 1849 to 1890. The two battles that were fought locally, and which were most directly responsible for leading to the Battle of Little Big Horn and the annihilation of five companies of George Armstrong Custer’s 7th Cavalry were the Sand Creek Massacre of 29 Nov. 1864, and the Battle of Washita on 27 Nov. 1868. The latter massacre was personally directed by Custer from a nearby knoll. Little Big Horn then followed 25-26 June 1876. Both of the massacres were mostly on women and children while the warriors were away. Having been promised peace by the U.S. Government, the warriors had left their families to hunt for meat for the winter. As the first shots of the Washita assault were fired, those in the Indian village immediately began waving both the American flag and a white flag. Of the 133 Indians killed by Col. John Chivington’s 700 soldiers, 103 were women and children, many being infants still strapped to back boards.